When you want to delete a campaign from your account, there are a few things to note. Any type of draft campaign can be deleted immediately, but ongoing ads or automations will first need to be paused or canceled. When you delete a completed, paused, or canceled campaign, you also delete the report, along with its report statistics. 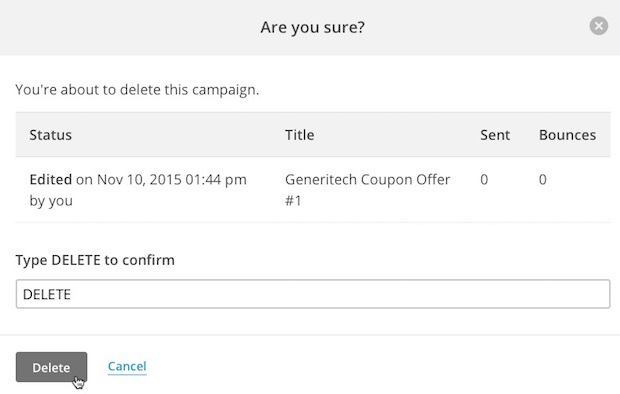 In this article, you'll learn how to delete campaigns from your account. To delete a campaign from your account, follow these steps. Check the box next to any campaign that you want to delete. To learn how to pause an automated email campaign before you delete it, check out Edit an Active Automation. To learn how to cancel an ad campaign before you delete it, read Pause or Cancel an Ad. In the Are you Sure? pop-up modal, type DELETE in all caps.